Rio Ferdinand rates Liverpool defender Joe Gomez very highly and has made a big prediction involving the youngster moving forward. The 21-year-old has been a crucial figure for Jurgen Klopp so far this season, making 16 appearances in all competitions as he has seemingly put his injury nightmare behind him and is establishing himself in the starting line-up. With six caps for England to his name too, it does certainly seem as though he has a bright future ahead for club and country, as he has shown his quality so far this season. In turn, Ferdinand believes that Gomez could be developing and improving into England’s best defender, but he’ll surely only earn that title if he continues to deliver consistently and at the highest level. The signs are certainly promising thus far, and that is why Ferdinand has made his bold prediction and given his experience in a similar position, he’s certainly well placed to make such a call. “The raw materials he’s got: the pace, the power, the desire, he’s aggressive, very cool under pressure and great on the ball,” he said, as quoted by the Daily Mail. “He also plays off both feet and his pace to make recovery tackles if he does make a positional error at the moment he’s been able to get out of trouble with his pace. Even when shifted to right-back, as he was against Paris Saint-Germain on Wednesday night, Gomez continues to display his strengths and attributes to great effect. While he perhaps prefers to play alongside Virgil van Dijk in the heart of the Liverpool defence, which is arguably the ideal place for him to continue to improve by learning from the Dutchman, that versatility will undoubtedly ensure he remains a vital part of Klopp’s plans, and for Gareth Southgate. 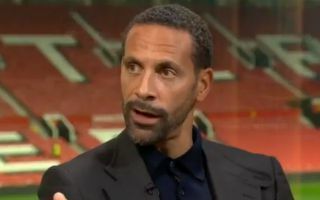 In turn, gaining that crucial experience and pedigree could aid him in living up to Ferdinand’s prediction.